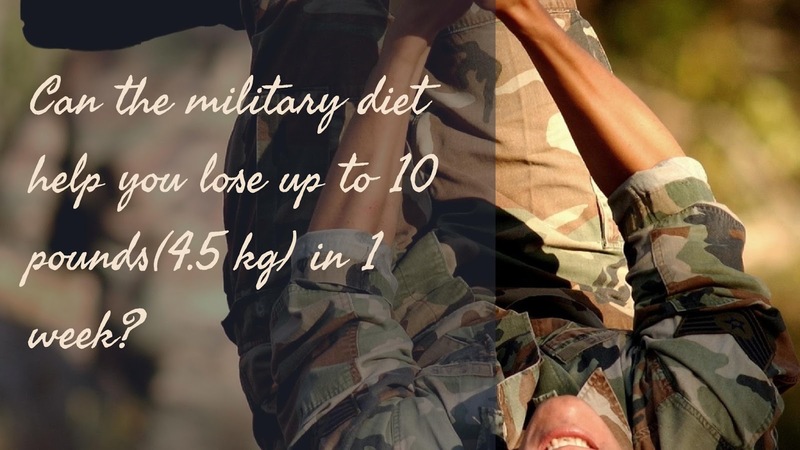 REVIEWING THE MILITARY DIET: CAN YOU LOSE UP TO 10 POUNDS(4.5 KG) IN ONE WEEK? We all know that dieting is one of the ways to lose weight. There are so many diets on the Internet and all of them are assuring us that if we try them, we will lose weight. They have also recommended a diet plan for the 4 days off the military diet so that you can continue to lose weight on these days. Furthermore, if you follow the military diet for a month, you may lose up to 30 pounds (13.6 Kg). 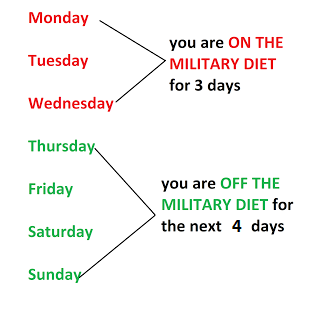 This means in a month, you go on the military diet for 3 days and off for 4 days in each week of that particular month. What drinks are allowed on the military diet? How will the military diet help me lose weight? The foods that you will eat on the 3 day military diet are actually low in calories. Calorie deficit = burning of fats in your body leading to weight loss. Since there are 4 days off the military diet, you wont suffer from slowed metabolism or malnutrition like other diets. Since the military diet is based on low calories, it is but obvious that the excess fats stored in your body will be burned in order to meet up with your energy requirements. However, you may not lose up to 10 pounds in 1 week. When can you benefit from the military diet? The military diet can be helpful for emergency occasions especially when you want to fit into a dress. Therefore if you have an up coming wedding, graduation, party or event, the military diet can help you fit into your dress in a matter of weeks. The military diet is based on foods, so unless you are allergic to some foods then you wouldn't notice any side effects. However, you might feel hungry or have little energy on this diet. This is because your body is adapting to take lower calories than it usually does. We recommend the military diet for temporary weight loss. If you want to lose weight permanently, a change in your diet and lifestyle is needed and you should't use the military diet to do this because it will be stressful and boring. All you will need to do is avoid junk foods and engage in physical exercise. The military diet will help you lose a few pounds, temporarily. For long term weight loss you will need the help of a nutritionist, fitness coach or advise from a health expert. There are foods to avoid when trying to lose weight. You also need to learn to stay away from junk foods that are disguised as healthy. These foods can ruin your weight loss journey! NB: This is very important!!! It is very important to note that the military diet doesn't say YOU WILL LOSE 10 POUNDS IN ONE WEEK, it says YOU WILL LOSE UP TO 10 POUNDS IN ONE WEEK. Therefore, it isn't guaranteed you will lose up to 10 pounds in a week. You may lose, 2, 5, 6 or zero pounds in a week. In addition to the military diet, you can try taking weight loss supplements that actually work, like Garcinia Cambogia Plus. This will help you achieve your short term weight loss.